year of 2018. 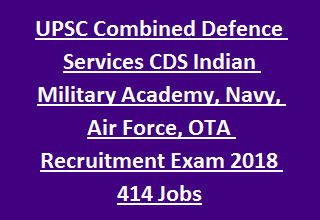 There are total 417 vacancies available in this UPSC Combined Defence Services of Indian Military Academy, Indian Naval Academy, Air Force Academy, Officers Training Academy for men 109th course and for women 25th Non Technical Course. Eligible candidates apply online on or before 26-11-2018 for this UPSC Combined Defence Services examination. Selection will be held based on written test and SSB Interview. 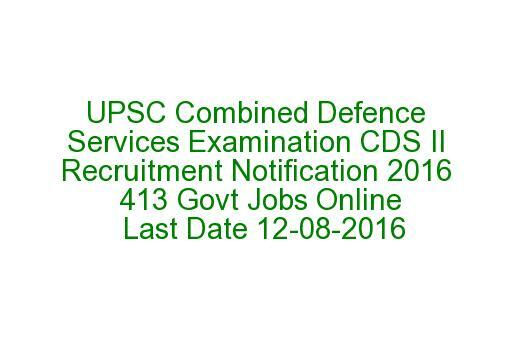 For more details reading this UPSC CDS Exam 1 Notification please see the details given below. Starting Date of Online Application: 31-10-2018. Ending Date for Online Application: 26-11-2018. Last Date for Application fee: 26-11-2018. Date of UPSC CDS Competitive Examination: 03-02-2019. There are total 417 vacancies available in this UPSC CDS Exam 1 Recruitment 2018. Post Name and Vacancy details are given below. (i) For IMA—Unmarried male candidates born not earlier than 2nd January, 1996 and not later than 1st January, 2001 only are eligible. (ii) For Indian Naval Academy—Unmarried male candidates born not earlier than 2nd January, 1996 and not later than 1st January, 2001 only are eligible. (iii) For Air Force Academy— 20 to 24 years as on 1st January 2020 i.e. born not earlier than 02nd January, 1996 and not later than 01st January, 2001(Upper age limit for candidates holding valid and current Commercial Pilot Licence issued by DGCA (India) is relaxable upto 26 yrs. i.e. born not earlier than 02nd January, 1994 and not later than 01st January, 1998 only are eligible. (iv) For Officers' Training Academy—(SSC Course for men,) Male candidates (married or unmarried) born not earlier than 2nd January, 1995 and not later than 1st January, 2001 only are eligible. (v) For Officers' Training Academy—(SSC Course for Women,) Female candidates (married or unmarried) born not earlier than 2nd January, 1995 and not later than 1st January, 2001 only are eligible. (ii) For Indian Naval Academy—Degree in Engineering BE/B.TECH from a recognized University/Institution. Eligible candidates has to pay Rs.200/- towards exam application fee. There is no examination fee for Female/SC/ST candidates. Candidates can pay the fee online or offline. Selection for this UPSC CDS Examination will be held in two stages. Computer based online written test will be conducted in three papers of total 300 marks for Indian Naval Academy, Indian Military Academy and Air Force Academy. Each paper consists of 100 marks. Each paper will be conducted for 2 hours. For Officers Academy Online written test will be conducted for 200 marks. Each paper for 100 marks with 2 hours duration each. Candidates have to login to the UPSC website of upsconline.nic.in and select the exam and complete the required data in given and upload the signature and Photo images. And pay the amount online using credit or debit card. If you are paying amount offline then generate the SBI chalana and pay the amount in nearest SBI bank. Finally submit the application form online and take a printout for future reference. Click here to apply Online for UPSC CDS Exam 2018. Click here to Download the Notification of UPSC CDS Examination 2018. Please share this information of UPSC Combined Defence Services Examination II Recruitment 2018 notification with your beloved friends through social networking sites.